Help us build Food Works, Sheffield's first sustainable food hub. Let's make a real dent in food waste, feeding people and sharing skills! Food Works not Food Waste! Value Your Food, Value Our Future. Food waste is a humongous problem. If food waste were a country it would be the 3rd largest producer of carbon emissions on the planet! Globally ⅓ of ALL FOOD is wasted, thrown in the bin and sent to landfill never to see a plate, fork or belly. Luckily we’ve been working hard for the last three years as ‘The Real Junk Food Project Sheffield’ collecting and redistributing perfectly good food that might otherwise have gone to waste. 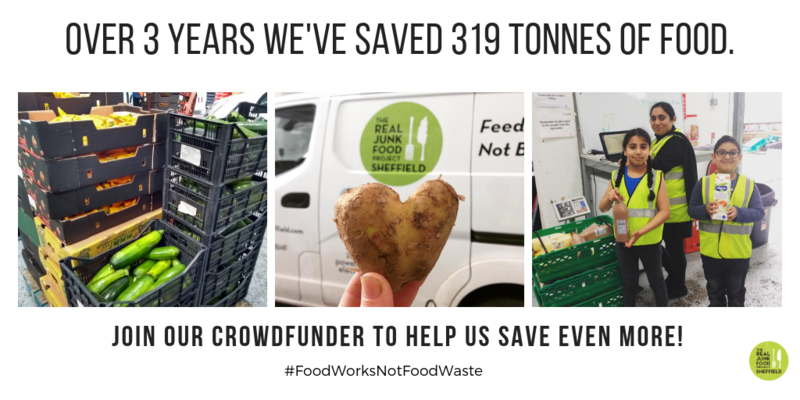 We’ve been able to save over 300 tonnes of usable food from going into the bins of Sheffield and created hundreds of thousands of meals with it. This is thanks to the support and help of a relatively small yet incredibly strong community of volunteers, food suppliers and sponsors. This 300 tonnes is only 0.1% of the food wasted in our city. The UN has said we’ve only got 12 years to prevent climate catastrophe so we REALLY need to get cracking on solving this! Our vision is beyond The Real Junk Food Project Sheffield. This is about tackling food waste at home, tackling food waste where it’s produced and so much more. We started small but we know we need to think BIG to make the impact needed to help our environment. 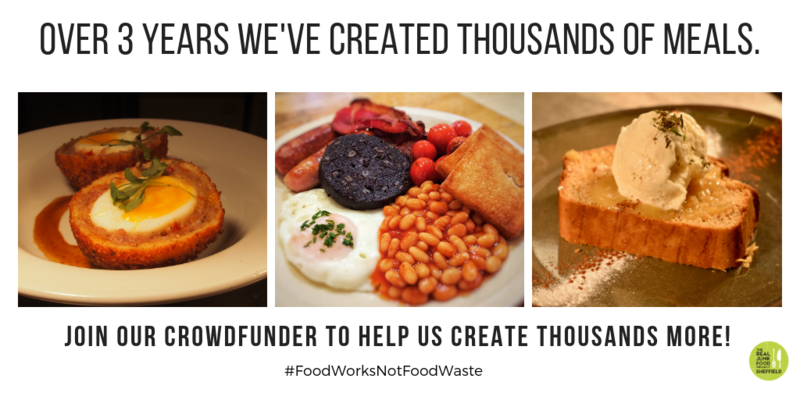 So that's why we’re changing our name to ‘Food Works’ and running this crowdfunding project to help us secure a permanent home and to fully equip it. We will need a big walk in fridge, some REALLY big freezers and a long term warehouse lease. We need to think bigger in every way except maybe our name, which could do with being a bit shorter. Step 1: Secure a long term lease on a food hub for Sheffield. Step 2: Invest in adequate fridge/freezer storage. Step 3: Invest in an onsite kitchen. Having a stable base to operate from. Working with more food businesses like farms, producers and wholesalers. Currently we work with 24 food businesses but there are many hundreds in Sheffield. Preserving, storing, cooking and feeding people with food THE SECOND it gets to the warehouse. No delays - let’s get feeding bellies not bins asap. Increase our education programs to include wider age ranges and workshops for all ages. Getting even more people in Sheffield engaged and involved! From volunteering, to training to eating there really is something everybody can do to help. If we carry on as we are, over 90% of food wasted in Sheffield is likely to end up in anaerobic digestion or as landfill generating methane and adding to our climate’s heartbreaking situation. 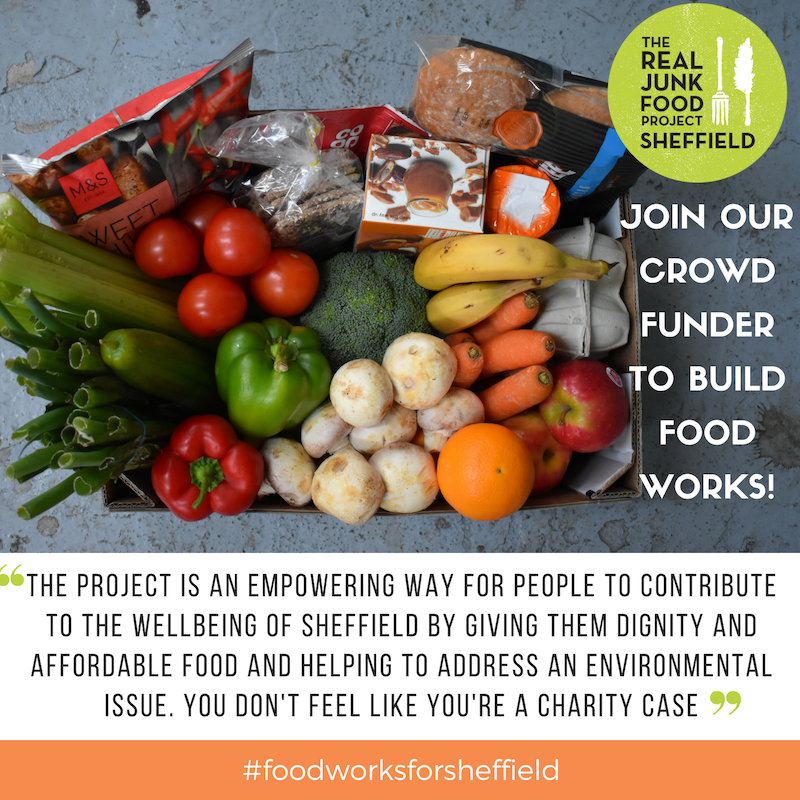 By pledging to support Food Works not Food Waste in Sheffield you will have a direct impact in solving this problem. Food waste isn’t going away any time soon but we can do so much more, today, to stop it damaging our planet. Bring people together with food - Our Pay-as-you-feel cafés; Steeple Corner Café and Citrus Café at Zest, provide 10,000+ meals per year. Broaden access to healthy food - Our Sharehouse Market provides 15,000 family food shops per year on a Pay As You Feel Basis. Educate the next generation - Working with 15 primary schools across Sheffield we deliver healthy food weekly so the children and their families can learn all about food. Our curriculum support materials help teachers to deliver real food knowledge to the next generation. Sustainable Catering For All - Our professional chefs deliver high quality ethical catering for weddings, meetings and conferences across Sheffield. Train Our Volunteers, create jobs - We provide our volunteers with the opportunity to develop their skills, earn the living wage and find a route into paid employment. Our volunteers often train with our professional chefs, drive our vans to collect surplus food from over 24 stores, and work on ad hoc catering jobs within the project. 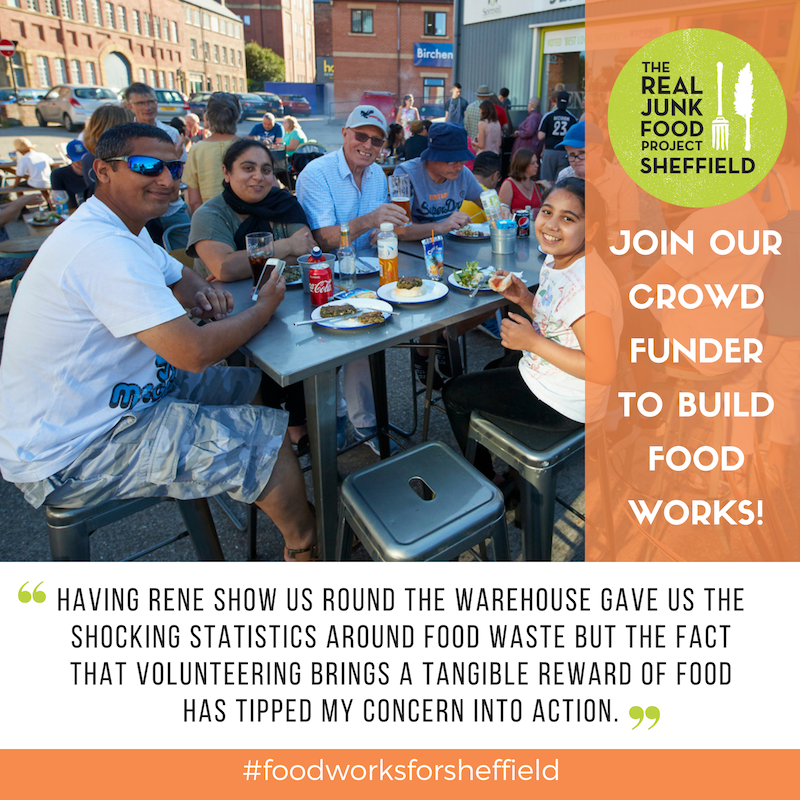 Pledge to join our Crowdfunder today to help us make Food Work not Food Waste in Sheffield! Tweet of thanks and glory! Pledge just £5 or more and get the recognition you deserve!  A dedicated tweet mentioning you by name, or by twitter handle if you leave the details. Treat yourself to a cuppa and slice of cake at either of our cafés - Steeple Corner Café or Citrus Café at Zest. Vouchers will be valid until July 2019. Valid for 2 people. What better Christmas gift then to make someone part of building a better world? Get a personalised thank you message for someone to let them know their gift has helped us build Food Works! Other amounts available - get in touch. Grab yourself a long lasting thank you by not only getting that warm fuzzy feeling of helping but ALSO getting your name on the wall of our HQ forever more to say thanks. Grab yourself a tote bag with our new logo to say thanks for your support. You can collect from our venues or we'll post it out to you for a litle extra - details on the payment page. The height of culinary fashions - it's the Food Works for Sheffield branded apron! Pledge £35.00 to help us reach our target and you'll receive a snazzy apron with our new logo. Limited edition of 200! You can collect from our venues or we'll post it out to you for a litle extra - details on the payment page. A selection of festive gastronomic delights! Chocolates, nuts, dates, chutneys, crackers, cakes and more. Collect from the Sharehouse Market from 21st - 29th December 2018. Success Party Invite! We're super optimistic about our Crowdfunder being a success so we'll throw a massive THANK YOU party to celebrate in January. Who's in?? Sustainable Combo - Tote Bag, Mug, Apron & Cake! **New Special Reward** Treat yourself to all 3 of our new branded merch! Choose this reward and you'll get a tote bag, reusable eco-mug (with FREE tea+coffee in our cafés for 1 yr), a branded chef's apron AND a voucher for Cake & A Cuppa for 2 at either of our cafés. This really is the mega combo! If you'd like to gift this we can send you a personalised graphic to send on to your recipient once you've purchased it. Just give us a shout. Warehouse full-on experience day - see the madness! Join us for a full day food-waste experience. From collecting food to sorting it, running the market and being fully immersed in the day-to-day Sharehouse activities you'll learn loads on this reward. Pledge £100 and receive a half day masterclass with our head chef. You will learn to make veggie and meaty scotch eggs and sausage rolls with plenty of hints and tips on getting the most out of your weekly shop! Dates tbc after Jan 2019. Event buffet catering for up to 50 guests. Delivered to your location. Food Works offers a wide range of catering options including canapés, fine dining evenings, wedding catering, meetings, conferences and more. The prices here are listed for simplicity, if there is something you would like that you can't see please get in touch. We're more than happy to offer bespoke packages as a reward. Dates available on request. Private fine dining in your home or venue for up to 8 people. We'll come to yours to serve a delightful 4 course meal cooked by our Exec Head Chef Brez Barwise. You'll need to sort the drinks and guests and we'll do the rest! Locations available includes postcodes S1-S35. Other locations in the Sheffield City Region available but will incur extra delivery costs. Cooking lesson for 6 with photos and recipes to keep. Spend time with our Exec Head Chef Brez Barwise learning how to make ingredients go further in the kitchen with friends or family. A great group experience! We've put a full year on this one so you can choose a date that suits you. 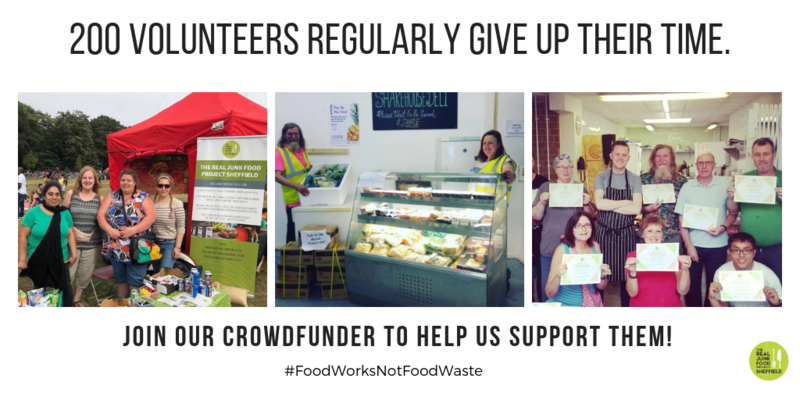 Your logo on the support page of our website, shout outs on social media to say thanks and a certificate of support for your wall to inspire others plus a Food Waste workshop for your team. Event buffet catering for up to 100 guests. Delivered to your location. Food Works offers a wide range of catering options including canapés, fine dining evenings, wedding catering, meetings, conferences and more. The prices below are listed for simplicity, if there is something you would like that you can't see please get in touch. We're more than happy to offer bespoke packages as a reward. Dates available on request. To REALLY help us reuse food effectively we are in desperate need of a large walk in fridge/freezer unit. At present we are using 25 donated old domestic chillers and freezers which cost £2,000 in electricity per year. This is neither environmentally or financially sustainable. Get in touch if you'd like to sponsor more - this is only 5% of the cost. Event buffet catering for up to 200 guests. Delivered to your location. Food Works offers a wide range of catering options including canapés, fine dining evenings, wedding catering, meetings, conferences and more. The prices here are listed for simplicity, if there is something you would like that you can't see please get in touch. We're more than happy to offer bespoke packages as a reward. Dates available on request. We have one of each wedding package available to book via the Crowdfunder for up to 150 guests. Choose either a full sit-down plated service for £4500 or a buffet service for £2500. Both options include 3 courses tailored to the couple's requirements. Dates available on request and location must be in Sheffield City Region. Venue list is available also. Your logo on our electric van and support page on our website, social media shout outs, 3 business breakfasts plus tuck shop for your office plus a certificate of thanks for your support for your wall!